I like to feed the robins in winter; the colder the winter, the more berries I will wear. I’m the guardian of the forest whilst the other trees take their winter sleep; bringing a surge of welcome colour into a grey world. 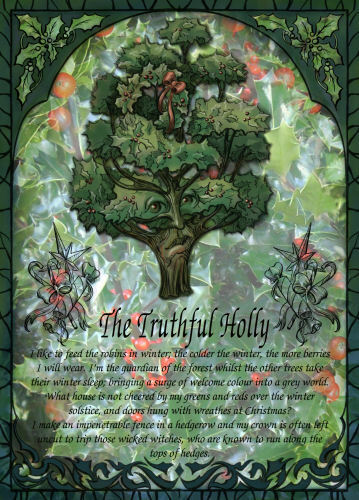 What house is not cheered by my greens and reds over the winter solstice, and doors hung with wreathes at Christmas? I make an impenetrable fence in a hedgerow and my crown is often left uncut to trip those wicked witches, who are known to run along the tops of hedges. One of a set of 12 tree-specific cards. Unique and only available from us.